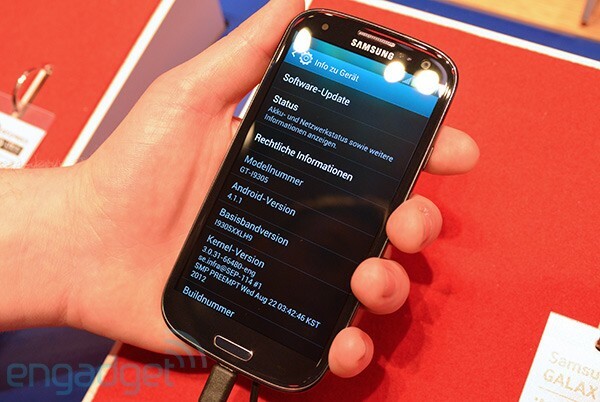 The about screen on your US Samsung Galaxy S III may look a lot like the one above in the near future (albeit in English). Samsung has officially announced its intention to make an upgrade to Jelly Bean available to stateside versions of the company's flagship, though it left out one very important detail: the actual date. Instead, all we know at this point is that an upgrade to Android 4.1 will be offered OTA and via Kies sometime in the coming months. Why so vague? It's likely because Samsung is now at the mercy of each individual carrier to finish testing the new version of Android on the GS3 before unleashing it to the public. The refresh will deliver some TouchWiz-based enhancements like Blocking Mode, Easy Mode and a few new camera settings, as well as the usual suite of Jelly Bean improvements like Google Now and expandable notifications. Head below to check out the press release, which offers a more detailed list of what to expect.